Upside Motion is turning 7 this April and we are hosting an anniversary party! With our Upsiders’ great support, we have grown stronger together these past 7 years on a journey to discover life on the Upside. CONNECT aims to connect and empower our community even more, raising awareness and garnering support for important causes. To celebrate this meaningful milestone, we are kickstarting the first installation: CONNECT (Women) to connect women from all walks of life by supporting the Daughters of Tomorrow’s (DOT) vision of facilitating opportunities for underprivileged women, helping them build financially independent and resilient families. The event will happen on Saturday, 13 April 2019 at Upside Motion Shenton studio! Sculpt, align and evolve for a good cause at CONNECT (Women) charity classes and be treated to our Upside Motion & ClassPass exclusive goodies. All proceeds raised from class ticket sales will be donated to the DOT. The first 15 attendees to purchase the tickets will receive a complimentary 10-minute accu-therapeutic eye massage by Crème Simon at the party. Join us as we feast on fine food and sip on Creme Simon organic artisan tea. Pamper yourself with lululemon therapy and be one of the lucky 'Giving Bowl' winners to be surprised and delighted! No time for class, just in for the party? Donate any amount to DOT donation box at the party to enter #MyUpsideLife Sure-Win Lucky Dip with plenty of awesome prizes such as class passes, merchandise and partners’ treats to be won. Make sure to RSVP HERE for a weekend full of Upside vibe! See you there! Since 2012, Upside Motion has been honored to be the destination of choice where our women find a stronger, healthier and better version of themselves. With our Upsiders’ great support, we have grown stronger together these past 7 years on a journey to discover life on the Upside. CONNECT aims to connect and empower our community even more, raising awareness and garnering support for important causes. Upside Motion is organising the first installation: CONNECT (Women) to connect women from all walks of life by supporting the Daughters of Tomorrow’s (DOT) vision of facilitating opportunities for underprivileged women. 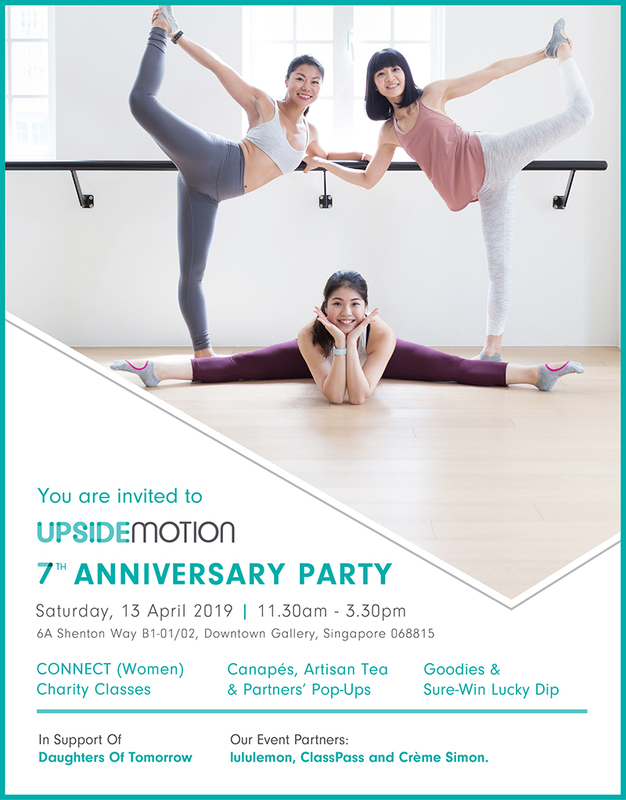 This event will happen on Saturday, 13 April 2019 at Upside Motion Shenton studio, in conjunction with our 7th Anniversary. Attendees will sculpt, align and evolve for a good cause at Upside Motion’s signature award-winning Xtend Barre and Pilates Mat classes and be treated to exclusive Upside Motion & ClassPass goodie bags. All proceeds raised from class ticket sales will be donated to the DOT. The first 15 attendees to purchase the tickets will receive a complimentary 10-minute accu-therapeutic eye massage by Crème Simon at the party. Daughters of Tomorrow is a local NGO whose mission is to facilitate livelihood opportunities for underprivileged women and support them in building financially independent and resilient families. DOT supports and complements existing training and workforce-related agencies by connecting volunteers and community resources to enable each woman on an individual level. By deep-diving into practical day-to-day constraints of these women, they offer hand-holding and individual coaching to help each woman reach regular and sustained employment.